While bone fractures require a doctor’s visit, homeopathy can still be part of the healing process, and can reduce symptoms. Here are five remedies to consider. 1. Arnica Montana: Arnica is a great remedy that is at its peak effectiveness when given within the first hour or two after the fracture has occurred. One or two doses can be effective. After the initial period, Arnica can be taken every hour or so, with a gradual reduction in consumption over the next few days. 2. Calcarea Phosphorica: If a lack of nutrition contributed to a large bone fracture, Calcarea is a good healer. Unlike Arnica, it can be used long after a fracture has been sustained. It’s effective for injuries that are healing too slowly, and works to fight pain from older fractures. It is most effective when used three times a day for a month after sustaining a fracture. It will also help prevent fractures, especially for people with a history of brittle bones (or teeth). Older adults will find this remedy most useful. 3. 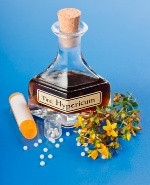 Hypericum: Better known as St. John’s wort, this popular herb is best known for treating depression, but homeopathic practitioners consider it useful for healing bone fractures as well. It is, like Arnica, best used immediately after the injury. It should be used frequently over the course of the first 24 hours, and then reduced three times a day for a week. It’s best for fractures that are causing shooting pain. Hypericum is considered by homeopathic practitioners to be the leading remedy for compound fractures, which are defined as broken bones projecting through the skin. Not only are compound fractures extremely painful, but they also put the area at a high risk of infection. 4. Eupatorium Perfoliatum: This remedy is not for use immediately after a fracture, but in the days and weeks following. It should be used every few hours for the first several days, and less frequently thereafter. It is a healing herb most effective for those who experience a deep pain, like a continuous ache, and who have bruising and inflammation. 5. Symphytum: This herb is generally used after an Arnica or Hypericum treatment. This remedy helps mend bones after they suffered a fracture of any sort. One thing to keep in mind about Symphytum is that any fractured bone must be reset by a doctor before it will work properly. But, it will help that reset bone strengthen to its former self. Symphytum is most beneficial to bones that are especially slow-healing.